Redoubtable hero Jack Reacher maintains his tough, uncompromising role in Lee Child's third hard-hitting, action-packed thriller.Digging swimming pools by hand in Key West, Florida, Jack Reacher is as tanned and as fit as he's ever been.A local girl says he looks like a condom filled with walnuts.Being invisible has become a habit.He doesn't want to be found.So when a private detective comes nosing around and asking questions, Reacher is not pleased.Especially when he later finds the guy dead. 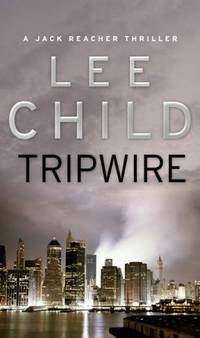 With his fingertips sliced off.Why was he so determined to find him?What does the vicious Wall Street honcho Hook Hobie have to do with it?And what about the reappearance of a woman from Reacher's own troubled past?Tripwire is a taut, nailbiting adventure which once again stars Lee Child's irresistible hero, the maverick former military policeman Jack Reacher. Transworld Pub. Paperback. VERY GOOD. Light rubbing wear to cover, spine and page edges. Very minimal writing or notations in margins not affecting the text. Possible clean ex-library copy, with their stickers and or stamp(s). Transworld Pub. PAPERBACK. 0553811851 Mild to moderate shelf/reading wear. CREASING ON SPINE. Binding good. Orphans Treasure Box sells books to raise money for orphans and vulnerable kids. . Good. London: Bantam Books Ltd, 2000. Reprint. Paperback. Good. Reprinted paperback edition in good condition with creasing to spine and minor wear to cover. Edges and pages clean and clear. No inscription or other writing throughout. A more than acceptable reading copy . London: Bantam, 2000. Later printing. Paperback. Near Fine. 17th printing of this mass market paperback edition. Third in the series of thrillers featuring Jack Reacher. A clean, unmarked copy in printed wrappers. Bantam Books Ltd, 02/03/2000. Paperback. Used; Good. **WE SHIP WITHIN 24 HRS FROM LONDON, UK, 98% OF OUR ORDERS ARE RECEIVED WITHIN 7-10 DAYS. We believe you will be completely satisfied with our quick and reliable service. All orders are dispatched as swiftly as possible! Buy with confidence! Bantam Books (Transworld Publishers a division of the Random House Group). Used - Good. Ships from the UK. Former Library book. Shows some signs of wear, and may have some markings on the inside. 100% Money Back Guarantee. Your purchase also supports literacy charities. Transworld Pub. PAPERBACK. 0553811851 Brand New ,Original Book , Direct from Source , Express 5-8 Business days worldwide Delivery. . New. Bantam/Random House India, 2000. Softcover. New. Digging swimming pools by hand in Key West, Florida, Jack Reacher is as tanned and as fit as heâs ever been.A local girl says he looks like a condom filled with walnuts.Being invisible has become a habit.He doesnât want to be found. So when a private detective comes nosing around and asking questions, Reacher is not pleased.Especially when he later finds the guy dead. With his fingertips sliced off.Why was he so determined to find him?What does the vicious Wall Street honcho Hook Hobie have to do with it?And what about the reappearance of a woman from Reacherâs own troubled past? 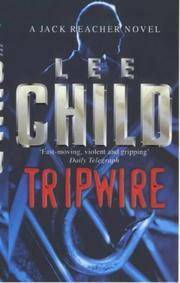 Tripwire is a taut, nailbiting adventure which once again stars Lee Childâs irresistible hero, the maverick former military policeman Jack Reacher. Printed Pages: 0. Bantam Books (Transworld Publishers a division of the Random House Group). PAPERBACK. 0553811851 . Very Good. Penguin Random House, 2000. Paperback. New. Transworld Pub. PAPERBACK. 0553811851 . Very Good.